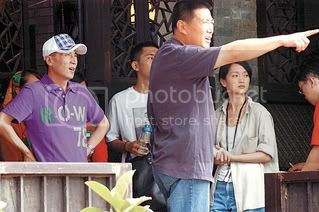 Aug 21th, The Encounters of Li Mi had the first official scene at a restaurant. In the morning, when reporters came to the place of shooting, everything was prepared carefully. About 10 a.m, Zhou Xun and Zhang Han Yu in the police uniform appeared. Reporters wanted to take photos of her but a staff in the dramatic team politely aksed them not to do that because at that time she was not made up. 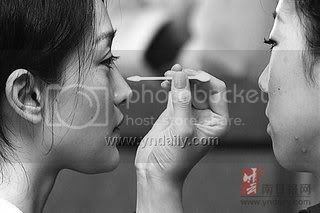 While being made up, Jue had cherry conversation with staff. It meant her mood was very good. Around 11 a.m, the first official scene was taken. 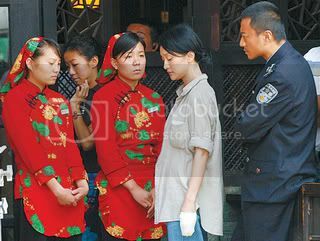 Li Mi and the police Zhang Han Yu went to the restaurant to seek Wang Bao Qiang,the lord of dealing drug.